The messaging industry has responded with an upgrade to SMS, a new messaging standard – RCS messaging. Globally, more than 23 billion SMS messages are sent every day – millions of people communicating with each other and with businesses. That’s hardly surprising since SMS is the most trusted of all messaging channels, and the most ubiquitous – every handset on every network has it baked in as a standard feature. Have we reached peak SMS? Smartphones and new platforms like OTT chat apps are enabling richer forms of enterprise to consumer messaging. And while SMS will continue to be perfect for many enterprise messaging tasks, like authenticating consumers as part of a secure password process, or notifying them that a parcel is on its way, richer engagement is quickly becoming the norm. In tandem, with smartphone ownership at an estimated 80%, consumers have become more demanding. 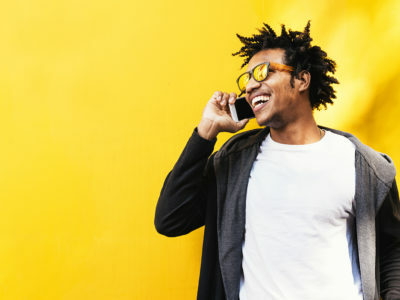 They want richer experiences with the brands and businesses that provide their banking, flights, or shopping, and they also want convenient customer service – the ability to ‘chat’ or interact when the need arises. In short, there is a real opportunity for enterprises to stop broadcasting to their customers and start talking to them instead. If consumers want a sticky user experience, why not give it to them? RCS offers a rich user experience that can be branded, contain images, interactive menus, linked buttons, video, maps, chat and chat bot like features, enabling things like the delivery of digital gig tickets and boarding passes for flights, through to image carousels where consumers can browse and buy. All from within a message. Importantly, RCS campaigns can include read receipts and AB testing so that messaging can be measured and improved on the fly. Download the third eBook in our series, which takes a deep dive on RCS and enterprise messaging. It provides essential reading on the trends and use-cases that are helping to form the RCS market today, as it moves from innovation through to an essential component of enterprise communication.